We all know recycling is the “right” thing to do. But have you ever wondered if it pays off? The team putting together the Screven Fireworks Show for the past decade would certainly say it does. 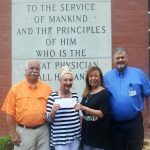 A check was recently cut by Wayne Memorial for $5,000 and donated to the city to help offset the show’s $15,000 price tag. Averaging 26 tons of recycled cardboard annually since 2008, the hospital sets aside the cardboard boxes shipped to it daily. Those 26 tons of crushed cardboard result in $5000 of proceeds. The year-round recycling effort is led by Joe Davis, Director of Maintenance and Security.